USA Attachments - "Universal Attachments for all major brand heavy equipment and more!" Fits all major brand dozers and more. This dozer rake allows you to clear land without stripping precious topsoil. This sturdy rake penetrates deep in the earth, and effortlessly removes unwanted roots, limbs, and debris. This rake has tough AR400 Steel teeth, making it more durable than dozer rakes of a lesser quality steel. Moreover, this rake is fully gusseted between the teeth and features heavy walled square tubing. 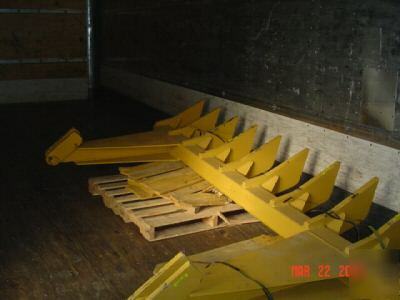 Rake comes with mounting brackets. Rake removes easily when not in use, and comes with a One Year Warranty. You May Choose Any Height For This Dozer Rake Ranging From 24" to 58". 750 850 D4H D5H, D6H, D6D, D6C, D47, D53, D65 and more.